More so now then ever, we are using our mobile devices constantly and pushing it to its last drops of power. Whether you have an iPhone or an Android phone, you can never have too much battery life. We've seen Mophie's battery cases for the iPhone, but now, after seeing Samsung's sales figures for the S III of a whopping 30 million units sold, Mophie's got a Juice Pack for the Galaxy S III. This ulta-thin and durable case is similar to that of the iPhone version. Housed in the back is a rechargeable battery that will theoretically double the life of your Galaxy S III. This means you'll get an extra 32 hours of music playback or 9 hours of consistent web browsing without having to worry about a thing. So if you do the math, this should last you an entire day without a problem. If you were worried about NFC or Android beam, the Juice Pack is compatible with them. On the backside, there is an LED display that informs you of the battery life as well. 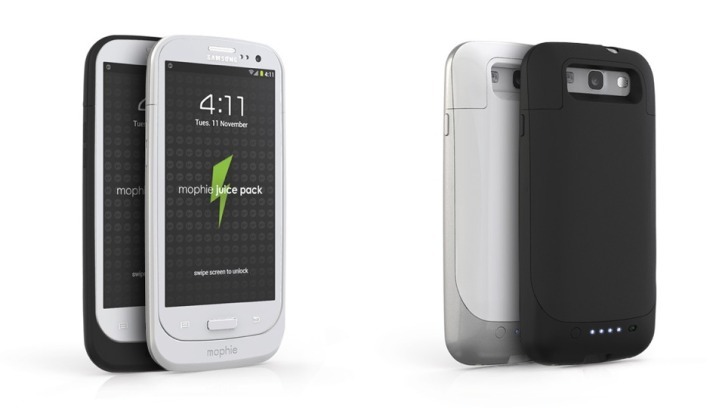 Coming in at $99.95, you can grab yourselves a Mophie Juice Pack today from their website and give your Galaxy S III the power it's been dreaming about.